You'll explore the less-touristy side of things at Biausevu Waterfall and Tavuni Hill Fort. Get outdoors at Natadola Beach and Natadola Bay Championship Golf Course. There's much more to do: get a dose of the wild on a nature and wildlife tour, contemplate the long history of Vatukarasa Village, see what you can catch with a fishing tour, and Head underground at Naihehe Caves. To find ratings, where to stay, maps, and more tourist information, go to the Sigatoka trip itinerary planner. Warsaw, Poland to Sigatoka is an approximately 31-hour flight. The time zone difference moving from Central European Time (CET) to Fiji Time (FJT) is 11 hours. Traveling from Warsaw in February, expect Sigatoka to be much hotter, temps between 36°C and 27°C. Finish your sightseeing early on the 27th (Wed) so you can drive to Pacific Harbour. Start off your visit on the 28th (Thu): take a memorable tour with Tours and then kick back and relax at Paradise Beach. For where to stay, more things to do, ratings, and other tourist information, you can read our Pacific Harbour road trip app . You can drive from Sigatoka to Pacific Harbour in 1.5 hours. Another option is to take a bus. Expect a daytime high around 36°C in February, and nighttime lows around 27°C. 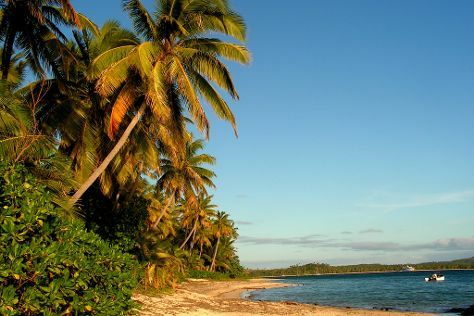 Wrap up your sightseeing on the 28th (Thu) to allow time to travel to Taveuni Island. Eschew the tourist crowds and head to Scuba & Snorkeling and Waitavala Natural Rock Waterslide. Get outdoors at Lavena Coastal Walk and Bouma National Heritage Park. There's more to do: admire the sheer force of Tavoro Waterfalls and experience rural life at Nabogiono Farms. To see traveler tips, ratings, photos, and tourist information, you can read our Taveuni Island vacation site . Getting from Pacific Harbour to Taveuni Island by combination of bus and flight takes about 4.5 hours. Other options: do a combination of bus and ferry. While traveling from Pacific Harbour, expect somewhat warmer days and warmer nights in Taveuni Island, ranging from highs of 41°C to lows of 41°C. Wrap up your sightseeing on the 3rd (Sun) early enough to travel to Mana Island. Kick off your visit on the 4th (Mon): kick back and relax at South Beach and then stroll through Sunset Beach. To see more things to do, photos, maps, and other tourist information, read Mana Island road trip planning tool . 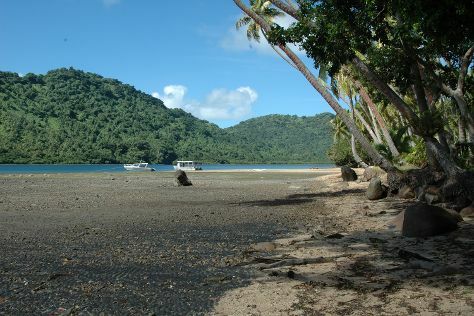 Do a combination of flight, taxi, and ferry from Taveuni Island to Mana Island in 5 hours. In March, daytime highs in Mana Island are 36°C, while nighttime lows are 27°C. Finish your sightseeing early on the 4th (Mon) to allow enough time to travel back home.